This huge church of 1936 will be a familiar sight to anyone driving out of Norwich to the north. It sits four-square at the Mile Cross junction, angled to ensure that it faces towards the east. 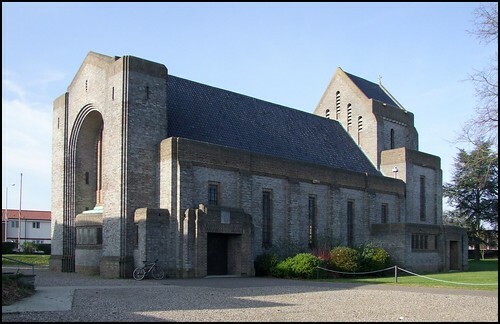 It replaced a Victorian brick-built church on the same site, and it seems to have gone up fairly quickly - on the 2nd of February 1935, Queen Mary laid the foundation stone, and on the 12th of November the following year the church was consecrated. The new parish had been carved out of that of Old Catton, and the project was bankrolled by a member of the fabulously wealthy Wills Cigarettes family. St Catherine is a concrete church, the walls faced in a brick which appears purple on a sunny day. The architects were Caroe and Robinson, and the style is a robust Norman - or, as Pevsner puts it more accurately, the effect is Norman, without any precisely identifiable medieval motifs. The best feature is the west front, unusually without any doors, and the louvred lancets of the bell windows which echo the great Norman churches of Castle Rising and South Lopham. How this church would benefit from a city square to its west! It is interesting to compare the building with its near contemporary St Alban, across the city in the southern suburbs. The architecture and construction are so very different. It seems extraordinary that St Catherine was completed two years before St Alban, and one wonders what Cecil Upcher thought as he looked across the city and saw this great pile rising. St Catherine captures the spirit of its age as well as any of Norwich's generally excellent 1930s buildings. The first sign of this comes as you come through the heavy, studded doors of the neo-Norman south entrance, and are faced with jaunty black leatherette inner doors with round portholes, as if we were in a cinema or on board a ship. This motif is repeated throughout the building. As you would expect, the building you enter is full of light, with the wooden floors and white walls typical of the 1930s, but there is also the huge delight (and you might have got an inkling of this from the doors) of the Art Deco furnishings, particularly the magnificent lamps which hang beneath the rather incongruous texts along the wall plate to the ceiling. The original hard wooden chairs have been replaced with modern blue ones, which successfully reflect the blue undersides of the neo-Norman archways. While the Art Deco is not as complete in this church as in its exact contemporary Ipswich All Hallows, Caroe successfully combined it with older motifs, which speak of the Anglican triumphalism of a decade earlier. The most striking of these is the huge stone reredos carved with scenes from the life of Christ. The lines of Art Deco lamps lead the eye to it, and it seems rather incongruous set beyond the clean lines of the wooden singers gallery. The thin lancet above depicts Christ in Majesty with St Catherine and St Felix, and is very much in the style of the William Morris workshop, although the artist was apparently one Hubert Blanchford. At the opposite end of the church is a fine western gallery, with the curiosity of two separate sets of Royal Arms, one those of George the Fifth, and the other apparently the standard of Queen Mary, who opened the building. One of the privileges of this site is that I sometimes get to go behind the scenes, so to speak, and it was with excitement that I climbed up the spiral staircase to the top of the church. This is a perfect 1930s moment, a nautiloid stairway, falling away beneath and giving the effect of climbing up the inside of a giant snail shell. At the top I walked through the long attic which runs the length of the building, the grills in the floor giving disconcerting glimpses of the church floor some forty feet below. At the far end I entered St Catherine's stubby tower, and here is the delightful sight of what is, surprisingly enough, the oldest set of bells in the city. They came from the redundant church of St Mary Coslany. They are suspended from the beam, and struck by hammers operated from pulley ropes below, but I can't help thinking that there would be room within this space for a bell cage so that they could be rung properly again. Mile Cross, famously, was the first big council estate in England, and despite its tower blocks it ill-deserves its reputation for being a rough area. Perhaps because of that reputation, and also because the church is strongly in the evangelical tradition, St Catherine is kept locked without a keyholder, which is a terrible shame. But when I investigated further, I found a parish which is yearning to be more open and welcoming, and which is trying to find a way forward so that this part of Norwich can have a space in which residents, pilgrims and strangers can enter into a sense of the numinous. In the meantime, you can find the church open for morning prayer each day from 9.00 to 9.30, and while I am sure that the last thing the kind Vicar wants is a constant stream of people knocking on his door and asking to see inside, I have to say that he was very welcoming to me.